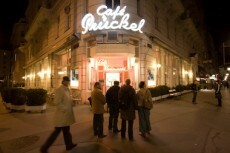 Café Prückel was built in the Ringstraße-style, a certain variety of Historism in Vienna. Ringstraße leads ringlike around the inner city and is lined by some of Vienna’s finest historic buildings. Café Prückel is in one of them with the MAK (Museum for Applied and Contemporary Arts), the University of Applied Arts and the Stadtpark (City Park) close-by. It opened in 1903 and was redesigned by the architect and designer Oswald Haerdtl in the Fifties. Partly remodelled in Art Nouveau Style, the rest was newly-arranged with exclusive Fifties interior. Offering several national and international newspapers, traditional Viennese cuisine, home-made pastries and cakes and the lot of Viennese coffee specialities – that are served with a traditional glass of water –, Café Prückel belongs to the classics of Viennese Kaffeehaus (coffeehouse) tradition. 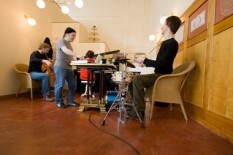 Readings, live piano-music or card-playing in the Golden Hall on some evenings contribute to its classy atmosphere.